[129 Pages Report] The global polymer filler market size is estimated to reach USD 53.10 Billion by 2020 at a CAGR of 3.3% between 2015 and 2020. 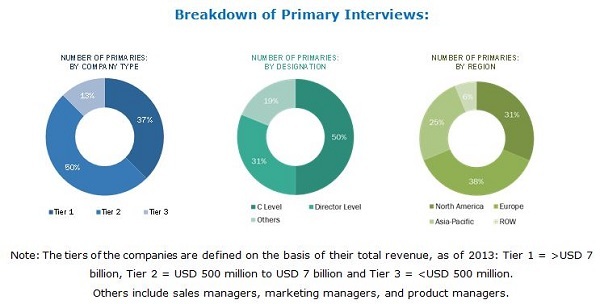 The report segments the market by type into (organic: natural fibers, & inorganic: oxides, hydroxides, salts, silicates, and metals), by end users (automotive, building & construction, industrial, and packaging), and by region (Asia-Pacific, North America, Europe, and RoW). The base year considered for the study is 2014, and the forecast period is between 2015 and 2020. Both top-down and bottom-up approaches have been used to estimate and validate the size of the global market and to estimate the sizes of various other dependent submarkets in the overall polymer filler market. The research study involved extensive use of secondary sources, directories, and databases such as Hoovers, Bloomberg, Chemical Weekly, Factiva, and other government and private websites to identify and collect information useful for the technical, market-oriented, and commercial study of the polymer filler market. The value chain of the polymer filler market starts with mining which has intensive environmental effects. Mineral rocks such as marble, gypsum, limestone, and mica are extracted and transported to the processing site. The processing involves crushing (grinding) of rocks to smaller grains. The processed fillers are further supplied to the end users through distribution channels. Manufacturers consider suppliers and distributors important in this market to increase their business foothold. Raw material suppliers are the calcium carbonate, talc, mica, glass, kaolin, and wollastonite manufacturers and suppliers. Various companies, such as Alpha Chemika, Triveni Chemicals, Axiom Chemicals Private Limited, manufacture calcium carbonate. Companies manufacture calcium carbonate, talc, mica, glass, kaolin and supply it to the polymer fillers manufacturers. Development of newer technology shall also be an opportunity for the polymer filler market. Emerging fillers such as carbon nanotubes and carbon fibers help in increasing the mechanical properties of the polymer matrices without compromising the quality of the polymers. Thus, polymer loading can be increased to higher levels and the cost and volume of polymer used can be reduced. This research report categorizes the global polymer filler market on the basis of application and region. The global polymer filler market is estimated to reach USD 53.10 Billion by 2020, registering a CAGR of 3.3% between 2015 and 2020. The rising demand of organic fillers such as natural fibers, wood flour, and hemp has forced automotive, construction, and packaging industries of various countries to initiate the use of polymer fillers. High-quality optical properties, improved impact strength, and ability to replace expensive plastic resins make it the preferred material for various applications. Polymer fillers are of various types, such as natural fibers, oxides, hydro-oxides, salts, silicates, metals, and others. In 2014, the salt segment accounted for the largest market share, in terms of volume, followed by oxides. 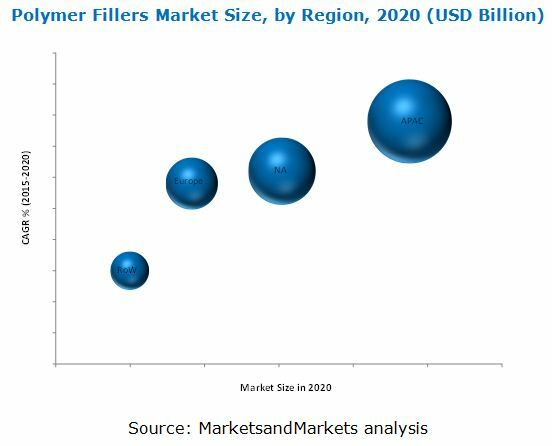 The rising demand for low-cost fillers in countries, such as the U.S., Germany, India, and Brazil, is expected to increase their demand in the coming years. The recent decline in the oil prices has boosted polymer manufacturing and increasing polymer production is driving the global polymer filler market in the near future. The demand for polymer fillers is estimated to increase with the rise in need for environment-friendly fillers. The use of polymer fillers in emerging applications, such as medical, recreational, and consumer goods are estimated to increase in the future, thus creating growth opportunities in the industry. The high demand in Asia-Pacific is due to growth in the building & construction and packaging industries in the last few years. The region accounts for largest share in the polymer filler market globally. North America accounted for the second-largest share in the polymer filler market in 2014. It is a diversified market for polymers due to the presence of large players in the region. The discovery of new gas reserves is expected to increase the investment in chemical and petrochemical projects in the region. Furthermore, polymer fillers are also used in building & construction projects. The U.S. is the largest producer of polymer fillers worldwide with the presence of manufacturing sites of major industry players in the country. Most of the big players are backward integrated and have the competitive advantage over other suppliers. Threat of new entrants is high in China, India, and other Asia-Pacific countries because of low cost of raw material and labor coupled with low requirement of technical know-how. Intersegment fillers replacement is restricting the growth of polymer filler market. The polymer manufacturers prefer low-cost fillers to high-quality premium fillers. In addition, the fillers can be interchangeably used depending on the requirements of polymers. For example, glass fibers are expensive; hence, calcium carbonate is used as an alternative for manufacturing polymers for the building & construction industry. Thus, the fillers can be replaced with other materials, affecting the overall market growth in terms of value. Minerals Technology Inc. has a strong presence in the polymer filler market with its two main products precipitated calcium carbonate and bentonite. The company plans to create a competitive advantage through the strategy of domain research, which means expanding existing businesses and mission research to create new businesses. Through mergers & acquisitions, it is focusing on enhancing its market reach. The acquisition of AMCOL provided the company new growth opportunities with regional expansion and new product development. This helped the company in increasing its revenue as well as market share in the polymer filler market. 11.11 Karntner Montanindustrie Gesellschaft M.B.H.